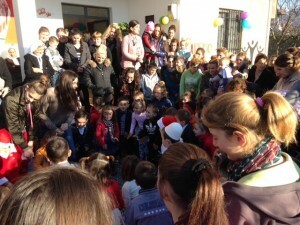 Christmas and New Year’s Day celebrated at our new building kindergarten. There were nearly 90 kids and their siblings (mothers, grannies, elders brothers and sisters) attending the event. We were able to get kids packages from ADRA Germany through ADRA Albania, a foundation which is involved in supporting marginalized groups in Albania. After the celebration with games, exercises, songs and dance we distributed these packages to the enrolled kids. It was a lovely and joyful atmosphere. Since 2000 the Albanian Sunrise kindergarten has been providing hundreds of Albanian children with top-quality education. On a budget that would be ridiculous in any developed country (55 cents per child per day), children, hailing from Albania’s northern provinces adjoining the Kosovo border, have been receiving a world class education that includes ecological awareness, introduction to English, music and creativity as well as physical and health education. “Graduates” from this program go on to do very well when they enter the nearby government primary school. In fact, much of the normal first grade primary school curriculum is already covered in the Albanian Sunrise’s rich neo-humanist kindergarten program. The Sunrise school exceeds the normal standard of kindergarten education and we are already having an impact on the local community. multicultural, universal values taught through stories, songs, games ecological consciousness developed through stories, songs, games. Introduction to the English language with songs and plays and the input of native English speakers. Health and physical education through games and sports. The method of education used at our school is Neohumanist Education developed by P.R. Sarkar. The emphasis of this system is to develop the physical, mental and spiritual qualities of the children and to prepare them for a world where all people will live together harmoniously. Summer 2014 we bought our own building where the kindergarten has moved, and the project is in need of regular support.